Each player has three shots to score as many points as possible by successfully kicking the ball through one of the different sized target holes. Try and chip the golf balls (air-flow or real) through the target holes. The amount of points scored depends on the size of the target hole chipped through. 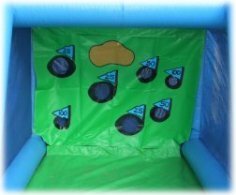 The inflatable is completely enclosed so you don't have to worry about stray golf balls! 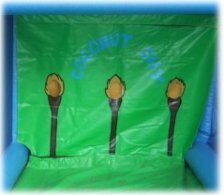 Three target holes in the coconut shy style backdrop to for participants to aim at. 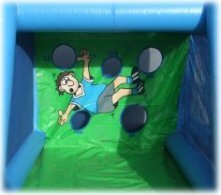 The enclosed inflatable means no stray balls to worry about. The backdrop has five clear vinyl pockets into which targets are inserted or alternatively pictures of people you want to shoot - Bosses, Politicians, and Celebrities are always popular target pictures! The Mini-Crossbows fire rubber-sucker tipped arrows for total safety. 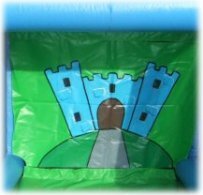 These Inflata-frame game are huge fun for Sports Days, Fun Days, family get togethers, BBQ's etc. The games can be linked up to provide a smart looking row of games.